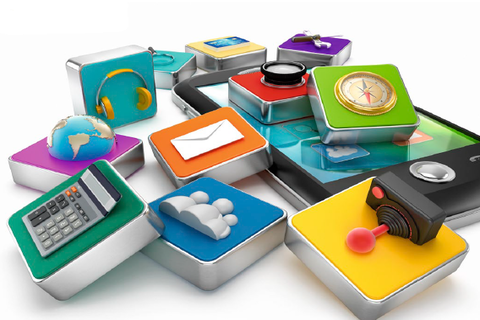 The phenomenal popularity of smartphones is bringing in opportunities to developers of mobile apps. Three local companies share their experiences in the development of their respective apps. <>There’s a $25 billion market out there for mobile apps, but with over 800,000 apps available each for iOS and for Android—and open-source tools that have made development much easier—the fight for a slice of that multi-billion dollar pie is pretty fierce. In this highly competitive market, three homegrown developers have carved their own niche through some hard-won lessons. Here’s what they’ve learned. Developing an app means that you’ll know all its inside workings—but you also have to know what goes on outside, too. That means intensively knowing your app’s intended end-users, as well as being aware of your competition. 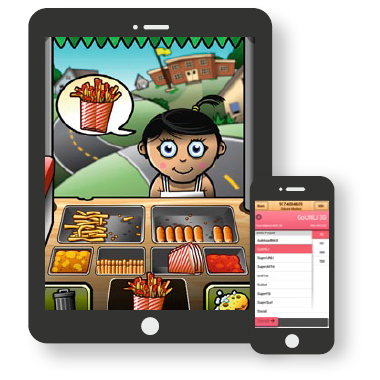 In his case, Garayblas was able to draw from his own experience—managing a food cart business—to create his first game, Streetfood Tycoon. 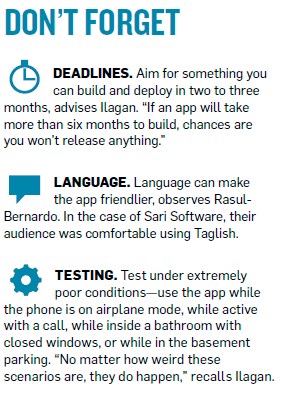 The world of sari-sari store owners, however, was foreign to Ibrahim Rasul-Bernardo and his team of developers at Sari Software Solutions, so they had to work closely with nanays who own sari-sari stores, to improve on their mobile apps for that audience. There isn’t anyone better than the end users to give feedback on apps, so Sari Software had the nanays work as product testers and early adopters of Sari Load, a mobile loading app, and Sari Scan, a small scale bar code scanner. With their help, Sari Load has gone through 30 iterations. One of the tweaks, for example, was the creation of an Utang button—important since stores run with as much as a third of their revenues on credit. The tweaks have been so successful, says Rasul-Bernardo, that the app’s learning curve for new users went down to 5 to 15 minutes, down from three hours initially. Is there a specific need or gap that you can fill with an app? Mobile and web solutions provider Seer Technologies takes this question very seriously, says company president Joseph Benjamin Ilagan. The staff is required to come up with a list of 15 everyday needs—annoyances or pet peeves, either from life or from existing apps on the market. Then, they identify one or two needs that can actually be turned into projects, thus providing solutions in the form of an app. Sari, on the other hand, wanted to remedy the lack of bookkeeping in sari-sari stores, since listing daily sales on paper is unreliable. The technology that they used in Sari Load and Sari Scan has been rolled out to a third app, product I|O, which addresses sales and inventory problems of their retail clients, especially those that can’t afford point-of-sale (POS) units in each of their outlets. “We started creating technology for the base first, and something funny happened: the technology is trickling up,” Rasul-Bernardo says. Streetfood Tycoon, for example, wanted to court a wide range of players. It needed to be easy to learn, yet challenging and engaging enough to warrant a longer shelf life and more in-app purchases. Since he wanted to project a fun and exciting experience to its users, a colorful and clean interface with lots of rewards did the trick. Ilagan adds that layout and style choices can also greatly influence user experience in any kind of mobile app. “If not done wisely, it will make your app look old,” he adds, which could push away younger users. Another important consideration that developers may overlook is user experience across platforms, Ilagan warns. Building once and deploying across different platforms like iOS, Android, and BlackBerry may result in wildly varying user experiences, especially with variations in hardware and tested conditions. “Once you overlook user experience and it affects your ratings and reviews, you’ll spend a lot more time and money trying to recover in the marketplace,” Ilagan stresses. The fight for a share of the multi-billion dollar mobile-app market doesn’t end with the download—customer satisfaction, app retention, and generated revenue are often more reliable measures of an app’s success. Sari, on the other hand, employs another metric: adoption. As a social enterprise with the stated goal to “empower small businesses and micro-entrepreneurs,” Sari didn’t want to charge sari-sari store owners for the technology; it was only important to the developers that their apps be deployed and used. Mobile app development is a humbling experience—67% of developers are considered below the “app poverty line,” earning less than $500 per app per month, says a 95-country study by market analysis firm VisionMobile. This means that most developers cannot yet make mobile app development their main source of income. It may pay to take on smaller gigs in the beginning, says Ilagan. “We charged lower than the usual freelancing rates just to build up our mobile portfolio,” he adds. These so-called smaller gigs paved the way for high-profile projects such as the mobile apps for online news portal Rappler, and Enjoy Philippines, a privilege card brand. To survive in the industry, recognize early on that technical or design skills by themselves are not enough, says Ilagan, who has been in the industry for more than a decade. This may mean that you’ll need a multi-disciplinary team consisting of technologists, writers, designers, and even domain experts who can help you better market your app and fortify your mobile app empire.